Tip #1: Bring your lunch!!! Yes, it's extra work. Yes, it's more fun to go out. But spending over $4.00 on a sandwich you could easily make for a fraction of the cost (and knowing how fresh the ingredients are) is sheer insanity! Moreover, if you have a daily chocolate habit like mine, you could be adding 250 (or more) calories to your diet that can likely be classified as I'm-bored food. That's 2.5 extra miles on the treadmill, people! Save yourself and bring your own apples and peanut butter. Or if you absolutely have to have something sinful -- pack a homemade cookie. My coconut chocolate chippers travel well. I'm just sayin'. Here's a tip to make it green: Invest in a bento-style lunch box (like the Laptop Lunch Box -- I scored one this past weekend for $20) and you can transport your foods -- like Stephen's bulgar wheat salad -- waste-free everyday. It'll pay itself off in time when you stop buying Ziploc and paper bags. Plus, it's exciting to see all your food laid out in cute containers. Oh, the best laid plans . . . I was doing so well until about a month ago. Then my daily trips to the coffee kiosk started again, and so did all my cash. I don't know why exactly I stopped making time in my evenings for lunch prep. But it happens to the best of us, which is why I've come up with a Plan B of sorts: Keep food on hand at work. From a health standpoint, I need to be careful with how bountiful a loot I choose fill my drawers. I tend to eat whatever is in sight. 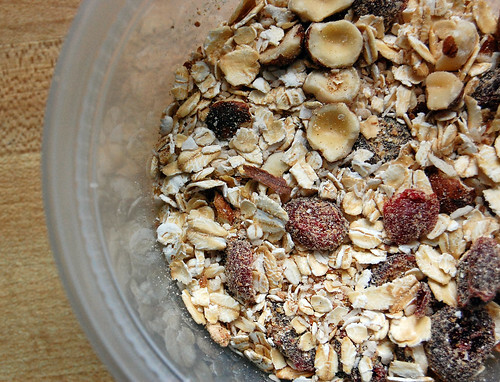 This got me thinking: Those instant oatmeal packets are not only a quick and easy way to get a warm meal on the go -- they're also relatively healthy if you get the right kind. And you don't typically want to munch on them without proper cooking, which makes eating too many of them a non-issue. But that isn't good enough for me. They're usually a bit too small for my appetite. Stephen found the answer. MAKE YOUR OWN! Not only is our new favorite lunch Plan B healthier than the store-bought variety -- it's also packed with far more tasty stuff, catered to our own unique taste. 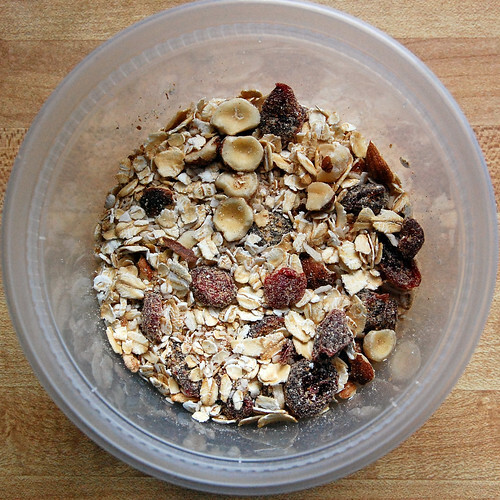 So, try out this recipe for the (never home)maker instant oatmeal "pack" -- and if you like it, double it, triple it, quadruple it, whatever . 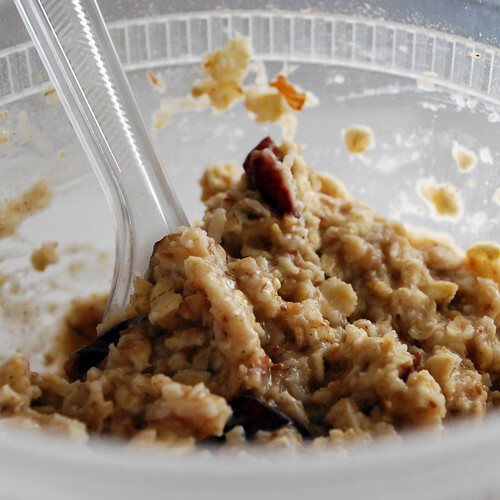 . . and you can fill an old oat container with the stuff, throw in a 3/4 cup scoop, and never feel stuck buying expensive crap-food at lunch when you forget to pack. Combine all ingredients. Mix well. I found it was easy to put them in a container and just shake. Portion out heaping 3/4 cup scoops of the stuff into baggies or containers . 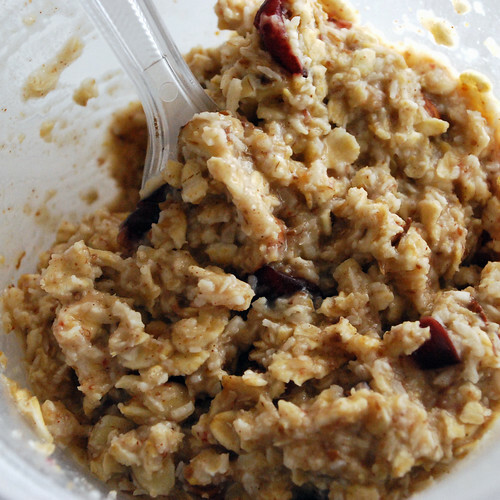 . . and if you choose to make way more, think of stashing it all in an old oat container with a scoop. 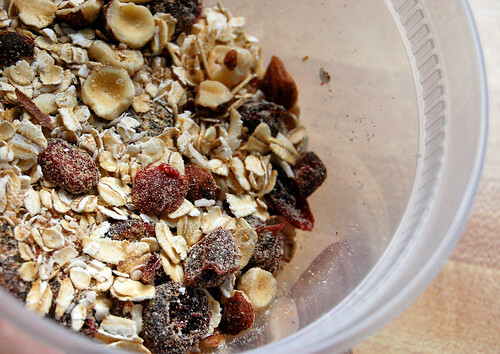 To make on the go -- just add water! About 1-1/2 cups of the hot stuff will do it. Or add cold water and microwave on high for1 to 2 minutes. Then mix and enjoy. So, the next time you're scraping pennies together to buy a Snickers bar from the vending machine: Think about making this stuff. Great for future low points (and we all have them -- I'll be the first to admit) . . . it'll help fill you up, sustain your energy, and the different combinations you can create are endless. The next one I shake together will definitely have some chocolate in it. Maybe walnuts. Etc.